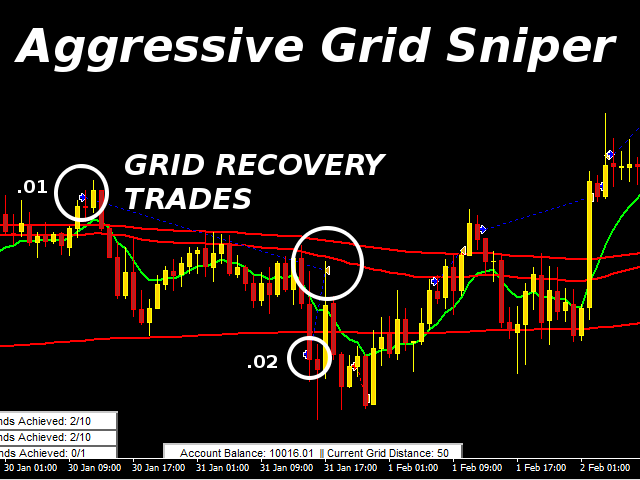 This expert advisor will open and manage trades using a fixed or incremental grid system. 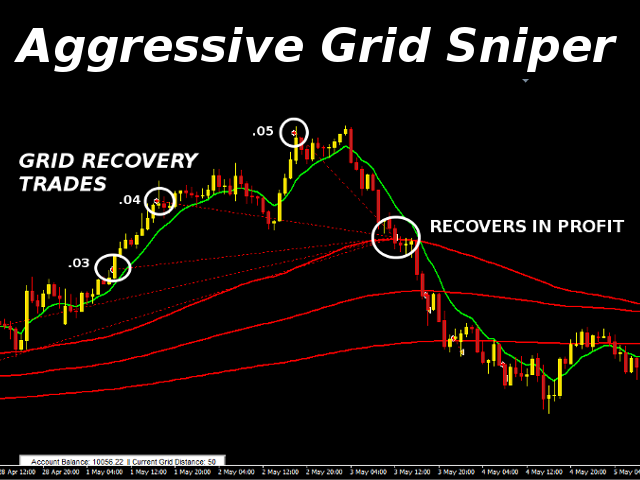 Default fixed grid distance is set to 50 pips while the incremental system, if set to true will adjust your grid distance according to the amount of balance in your account from 50 pips down to 10 pips in increments of 10 pips. Magic Number (Set to 0 for Manual Trading with Grid) - Using this Grid with other EAs must use the same magic number. 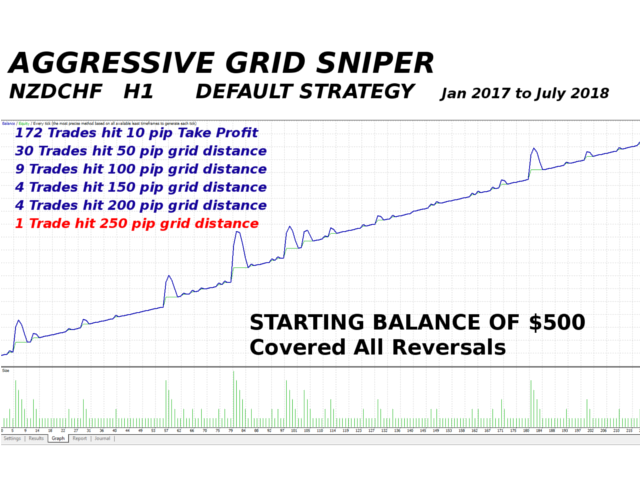 Incremental grid distance (50-10) - This will automatically adjust the grid distance according to the amount of balance in your account. Set this to true for a more aggressive system. If you Set to true then use only one pair in one account. If you Set to false can be used for multiple pairs in one account. 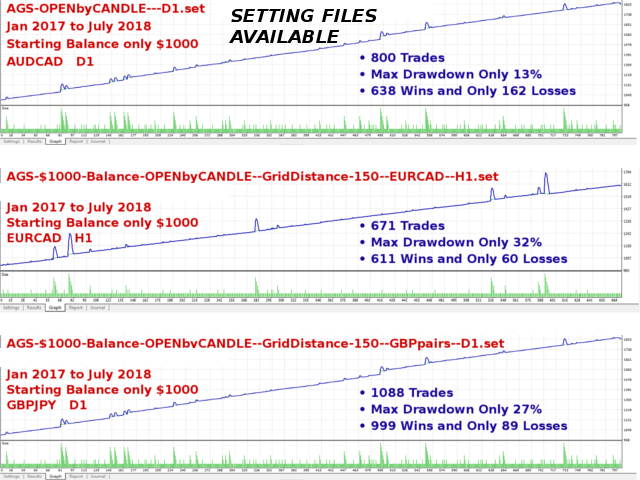 Incremental balance for grid distance - The Grid size will automatically adjust from 50 Pips down to 10 pips distance incrementally from this starting amount. Fixed lots - This will force lot sizes to never change. Lots increment - This will adjust lot sizes incrementally by this value when a trade is losing according to grid distance settings. Open by Candles - This will open buy trades when X number of bull candles are consecutive or sell trades when X number of bear candles are consecutive. 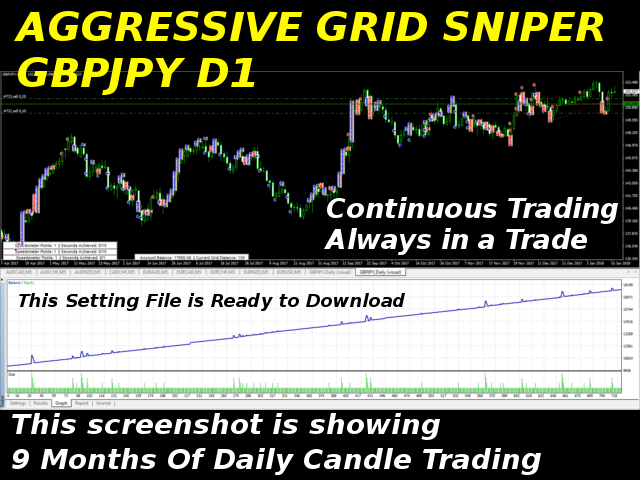 Open by X pips in X seconds - This will open buy trades when the speed of the price is moving up X number of pips per X number of seconds or sell trades when the speed of the price is moving down X number of pips per X number of seconds. Open by MA cross MA - This will open buy trades when the first moving average crosses up through the second moving average or open sell trades when the first moving average crosses down through the second moving average. I have tested the Aggressive Grid Sniper. First time doing this and Scott was especially kind and patient with me. It did what he said it will do. Good for 2 weeks of Demo and am now going to run it on a real money account. Good EA Scott, your a real pro. Im testing this AGS EA for a week on real acc,Amazing EA and friendly creator Scott who always provides help if you stuck with settings or having any problems or questions .thanks! i will update next week !!! Using for about 2 weeks results very good !Recommending! 05/10/18 update this week 14% profit so far so amazing !!!!! - Optimized a few small things in the code to fix a problem that in some cases more than 1 initial trade would open.